Many people look for a facility in Microsoft Word that could open the last used document automatically. Or you can say when you open MS-Word, the most recently used document should also open on its own rather than opening Word to the Start screen, and then opening the file. Press enter and MS-Word will open with the most recently opened document. It would be much easier to use if you create a shortcut for it. Go to Desktop and take right click on any empty area. Select New > Shortcut option. Now paste that path with quotation marks. Click Next button, give this new shortcut a name and you’re done. A new shortcut will be created on your computer’s desktop. Double click it to open MS-Word and the most recent document. 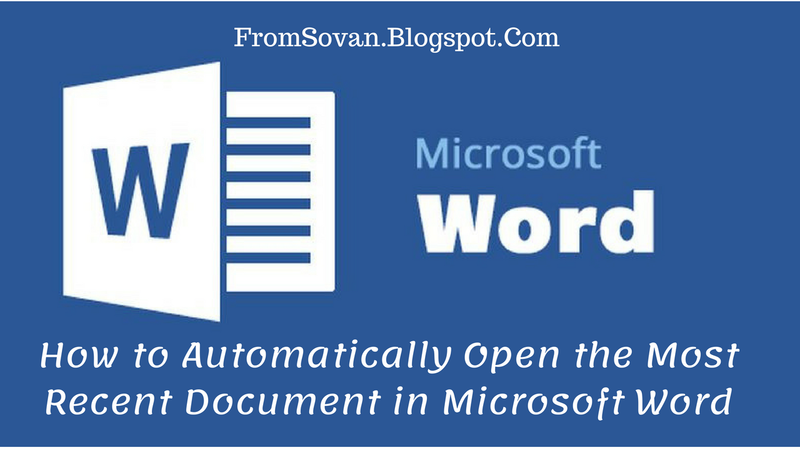 I hope this article about "How to Automatically Open the Most Recent Document in Microsoft Word" will help you. If you have any question, query or problems then please write in comment section or you can contact me at fromsovan@gmail.com. I think you're doing a great job without expecting anything.